Can I brag for a minute? I met with Jack’s teacher today for a post-progress-report conference. I wasn’t concerned about anything, I mostly just wanted to go hear about how wonderful Jack is. And I was not disappointed. Jack got all “S’s” and a few “S+’s” in everything except for knowing his phone number, that was an “I” for “improving.” (I taught him our phone number last year, but failed to practice it with him, so he forgot it.) Mrs. M. said that she’s actually pretty stingy with her “S+’s,” but Jack just knows his numbers and patterns too well. He’s the best in the class at patterns, in fact. He also is a good leader and follows directions really well; she never has to tell him anything twice. (This is slightly different from my experience with him.) All in all, he’s a joy and delight to have in class. But you know the best part of the whole thing? She said that he’s a good leader and will help kids who are struggling with their work, and that he is kind about it. Because if I had to choose between raising a child who is kind and raising a child who succeeds at school, I would a thousand times rather raise a kind child. Oh! And they asked the kids today what they want to be when they grow up, and Jack said he’s going to be a scientist. “What are you going to study?” his teacher asked. “Whatever interests me,” he said. You know how old ladies have a tendency to tell moms with little kids to make sure they savor every moment because it all goes by so fast? And meanwhile the moms are counting every dragging minute till bedtime? Well I was at the mall yesterday with Nora and Ann Marie and two old ladies came over to admire the baby. There was much oohing and ahhing over my sweet baby, and it turned out the first lady had a daughter named Ann Marie. Then the second lady said, "Oh, to be young again! Enjoy it!" and the first lady said, "Oh, I wouldn't do that again! I had seven, that's enough for me." My kids were being sweet and enjoyable that day, so I didn't have much to complain about at that moment, but I couldn't help but think of this post, and smile to myself. It was just so refreshing. At any rate, Jack watched an episode of Peep and the Big Wide World while there, which was a refreshing treat for me, because I love Peep. We never seem to watch it here anymore; it’s usually not on during the times I let them watch TV. In this episode, Peep, Chirp, and Quack were trying to fairly divide two crackers among themselves. They started by breaking each cracker in half, so everyone got a piece with one piece leftover. They broke that into four, and I think you can see where this is going. They went through several iterations until Peep finally said, “Will there always be one piece leftover?” but then an ocean wave came and whisked away the last piece. 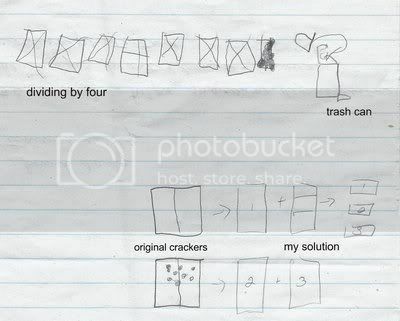 See, he would divide both crackers in half, then break the last piece into four, and break THAT last piece into four, and so forth, and he’d do this seven times according to his drawing. And THEN, he’d take the last final piece, and throw it away. Right off the bat, I’m thinking I’m not cut out for a review like this, because I can’t think of anything. Not one thing! I mean, besides “have a third baby” but I’m already planning to use “baby” as my answer for 50% of these questions, so shouldn’t I come up with SOMETHING new I did? Hmm. Flew across the country with two little kids? Got some financial software up and running for the organization I work for? These seem lame. I want to say something like, “Ran a marathon and came up with a cure for cancer on the way,” but I don’t have anything like that. Mostly I hung in there. Last year I made three resolutions: Find a place for everything in my house and get rid of the stuff that has nowhere to be, run two 10k’s, and call people more/cultivate more phone-friends. I did pretty well on the first one; while I wouldn’t say that everything has a place, but we cleaned the attic and I threw out/gave away/donated quite a lot of things. It’s hard to get on top of this when more stuff is coming in all the time. But I have definitely had a mind shift this year, and I think about where I’m going to put something before I buy it. Also, when the time comes to tidy the house, it’s generally less stressful because a lot of the stuff that used to just go in a pile now has a permanent home. So I’m calling it a win. I completely failed at the second two resolutions. I give myself a pass on not running two 10k’s, though, since I was pregnant. I had already registered for one in May when I found out I was pregnant and I tried to run it anyway, but instead I lay on my bed, took a nap, and cried a little about feeling so terrible. I did not register for second, obviously. But once the debilitating fatigue, nausea, and depression that came with the early part of this pregnancy had passed, I did think I’d be able to keep jogging throughout the pregnancy. I know, isn’t that adorable? I went twice, maybe. As for making new phone friends, fail. Utter fail. I called Arwen once. I called Annie a bunch of times, but we never managed to speak, mostly because of the time difference and resulting conflicting nap/feeding schedules, I think. I did talk to Maggie one time, but she called me. Oh! And I called A'Dell once. The calling people turned out to be the hardest one, because I think I’m always afraid I’m going to have nothing to say if I call someone just to talk, but I’d really really like to have a cadre of friends I can call when I need to speak to another adult. It’s a conundrum. So for this year, I’m making the same resolutions: Keep organizing the house. Run two 10k’s. Call people. Me, obviously. Many internet friends, eg: Diane, A'Dell, Maggie, Lucy, Arwen. A new friend I made this fall had a baby in November; her daughter is in Jack’s class and she also has a two-year-old and now a new baby, so we are a matched set (except for genders, hers are girl-girl-boy, mine are boy-girl-girl). Infinite patience. And hell, infinite money. Why not, right? Just as likely. On the realistic side, I’d settle for MORE patience and some perspective when it comes to the level of clutter in my home. I don’t want to live in a filthy mess, but I also don’t want to spend all my time maintaining (or attempting to maintain) an unrealistic level of cleanliness/organization when I could be living my actual life. December 3 is the only date I will remember since it’s Ann Marie’s birthday. Otherwise, the days I remember are our trip to California in June, the times I took the kids to the beach in the summer, our hikes through the local state park, stuff like that. I won’t remember the times I cleaned the whole dining room; hence my answer to number 6. I think I’m going to have to say it was managing to stay mostly sane and keep living a mostly normal life while pregnant and then delivering a baby. Remember, I’m taking full credit for the ease of Ann Marie’s birth, deserved or not. I think my failures are the same as many parents’: All the times I’ve lost my patience and snapped at my children for just acting like children are my biggest failures. Most especially the times I, myself, have thrown a tantrum because things aren’t going my way. Yes, actually. In July, I dropped the shower head on my toe, and the toenail is still black and is going to fall off soon and I’m scared. Gah. I also had a mysterious illness in September that made my entire body hurt to the point that Percocet only took the edge off. It was pretty much horrible. I never got a diagnosis other than “viral” and it eventually went away, but it was a loooooong week or two. I also had a bunch of sinus infections. And of course, I was pregnant, which certainly feels like an illness a lot of the time. This was a tough one to figure out, but I think probably our California trip. We had a great time and got to see old friends. I also got a Phil & Ted’s Dash for half price (HALF PRIIIIICCCEE! ), but time will tell if it proves to be as awesome as I hope, since Nora’s too tall to sit in the doubling seat when it’s up front, and that’s the only way she and Ann Marie can both ride right now because Ann Marie needs the main seat to be flat. But when Ann Marie can sit up, it is ON. Oh, mortgage, by far. And then probably food. I’m kind of snobby about what food I buy. Well, the trip to California, for one. And the birth of my third child. And Christmas break. And the times my kids spent a night or two at their grandparents’. Probably mostly that last one, though. And now we reach a question that makes me feel like a loser, because I don’t KNOW any songs. All I ever listen to is NPR. I do like Adele, even I couldn’t escape hearing her songs all year, and I also like OK Go, but I don’t even know if that’s from this year or not. I am so unhip. But maybe I’m approaching this wrong: Nora’s favorite song is “Twinkle, Twinkle, Little Star,” so I’ve heard and sung that approximately 4378925 times this year. So maybe that one? – thinner or fatter? Fatter, but I did just have a baby. – richer or poorer? Probably about the same, depending on how you measure it. Net worth is possibly higher, but as far as actual lifestyle cash, the same. I’ve been pondering this question for a while, and I think I’ll have to say exercise. I did walk a lot, so I guess I did pretty well for a pregnant person, but I miss exercise when I can’t do it. I also wish I could have seen more movies. This may make me shallow, but I love movies, and I currently can’t even stay awake for a whole movie at home, never mind going to a movie. Any pointless time wasting or yelling at my kids instead of dealing with them patiently. We spent Christmas Eve with my family (Ann Marie makes it a total of 15 grandchildren on my side), then went to the pageant mass, which was at 5:30. Afterwards, we brought the kids home and put them in their PJs, and then drove around to look at Christmas lights. This was a mistake, because on the way to a particularly crazily-lit-up street, Jack asked us to turn the music down so he could sleep. Oh, well, Nora saw some of them. When we got home, I think we tried to watch a movie, but I fell asleep (see question 16). Then we had Christmas morning at our house and spent the afternoon with my in-laws (grandchildren count: 5). It was very lovely. Hmmm. Probably still Burn Notice. I didn’t read any books that made me say “WOW!” this year, but I liked Snuff by Terry Pratchett, A Visit from the Goon Squad, Ape House (which I technically read this week but I’ll forget by next year), and a bunch of other books that I can’t remember. The only movies I saw in the theater were Harry Potter and The Muppets and they were both awesome. I turned 35, and Andrew made me a cake. There is a difficult person in my life, and she created a situation where I fantasize about responding with the childish thing instead of the adult thing (which is what I did), and in my fantasy it totally schools her. This would have been immeasurably satisfying. This may be petty, but there you go. That difficult person did some things that got me really upset, so I learned that it takes me a week to get over the things hateful people do. After a week, I can laugh about it instead of cry.